The scene is set for the most significant days in the history of mankind. Drawing inspiration from Scripture, the writings of the Saints and mystics and the imagery of Mel Gibson's the "Passion of the Christ", "Gethsemane to Golgotha" leads us through the events of Passion Week through the eyes of the main characters. The songs are meditational in nature, as all of the Passion Week relived through Scripture brings home the enormity of what Jesus has done for each and every human being. Sonlight is a band based in Cookstown, Northern Ireland, but it's members are drawn from both north and south who are brought together by their shared faith and love of music. 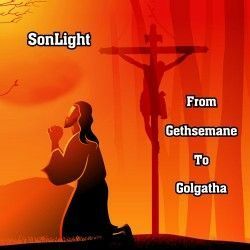 As the music ministry team for the Sacred Heart House of Prayer in Cookstown they have written this album as a meditation through the scriptures and other sources which is literally the last few hours of Jesus life taking the journey from the garden of Gethsemane where Jesus prayed through to Golgotha, the place of crucifixion. Many of the songs invite us to consider the events from the different people surrounding the event as well as Jesus perspective. So the first track is called "The Magdalene" and considers that love that she felt for Jesus and her distress when they come to arrest Him, through to the moments sitting at the cross with His mother. For the purposes of this song and the narrative it presents the lyrics place Mary as the prostitute that Jesus saved, although it has to be said there is no Biblical evidence for this, but it is a theory that has been around for a long time. In this song it shows the difference between the hatred self-righteous people who were going to stone her and Christ's genuine love. The song is beautifully sung with a driving guitar which counterpoints the genuinely beautiful and softer female vocals. As the song talks about Jesus' love and care and finishes with a declaration to tell the world these are things that we can echo and identify with. We have a more brooding and theatrical performance with the second track, "Father, I" which expands on what Jesus was praying in the garden of Gethsemane. The song sees some of the wrestling between the distance from the Father because of the circumstances, but also the submission and obedience to God, knowing what must come. Simply backed by piano this track acknowledges the humanity and divinity of Christ in this moment. This leads into another track called "Don't You See?" also written from Jesus' perspective and wonders why the people cannot see his real nature as he is questioned by Pilate. Through this we are able to acknowledge that now, with hindsight, we can see what God was doing that day through Jesus. This track has a female vocal but the band want to make it clear that this is not a political statement that Jesus or God is a woman, it's just the female vocal fits better to the song. "Peter's Song" is an interesting track. Musically it's a lot heavier, with a really strong electric guitar opening up the track in a standard rock style. I love the character of Peter in the Bible and I always see a bit of a mirror in him. This song deals with the moments around the last supper table, the conversation and the arrogance of Peter that he knew better than Jesus. It takes us on the journey through the denial itself and the dawning realisation that he spoke from the heart, but without the conviction to follow through. How many promises do we make to God that we mean wholeheartedly, but the moment things get difficult, or if it starts to cost us personally we give up? Or alternatively we mean to live out our word, but days pass by and our commitment and zeal fades? This song doesn't take us through to the end of Peter's story, but we know that there was redemption and forgiveness, and this resolution made Peter the apostle that he became, ready to really die in order to serve Jesus and proclaim His story. Of course there are many important characters in these moments and after considering the commitment of Peter we discover the betrayal of Judas Iscariot for "30 Pieces of Silver". This is sung as a lament initially with some interesting vocal inflections but also quite repetitive. There seems to be little remorse or regret at first, but as the song continues it's the idea of Jesus being betrayed by a kiss that seems to bed in his head and then the shame of what he did becomes more apparent. The end of the song is hard to listen to as he hangs himself and the song in it's last moments becomes heavy metal anguish. It's not easy to listen to, but very theatrical and powerful! "As I Walked" is another meditation on Jesus' thoughts in the moments leading to the cross. There is no confusion in the mind of Christ, but there are the opposing ideas of loving the people and the darkness and demonic lingering in the background. This is a song of ultimate love overcoming the hatred surrounding him both physically and spiritually. "He Is My Son" is an idea of what Mary was thinking in these moments as she watches her beloved Son led to the cross amid jeering and hatred. Then the song switches across to Jesus watching His earthly Mother and His love for her and his thankfulness for her part in His story. The song reflects on the prophecies given at Jesus birth as well and that this in Jesus death is coming true. The song is a beautiful duet which ends with the two lead singers alternating lines and reflecting a reiterating their feelings. The album ends with another track which reflects some of what Jesus might have been thinking on the cross as he utters the words of forgiveness, but also his feeling of abandonment by the Father. For the first time feeling forsaken by God as He cries out this song is very reflective mulling over some of Jesus words on the cross. The song has a very definite ending, there is hope in this song, but the end of this album is very final with one last piano chord which reflects Jesus giving up his life. One word that I have used for many of these songs, no matter the style is theatrical. This album could be dramatised and adapted for the stage because it takes a step-by-step approach to the journey that Christ made, of course it would have to have overlaps to make everything work, but I believe that someone could really make this work. Each song is beautifully written and reflects scripture whilst adding thoughts and feelings that have come from other sources and the writers own inspiration, as well as consideration of the larger story of the Bible. So we have some well crafted and quite intense tracks on this album and if you are looking for something to meditate on through this upcoming Easter period then I would definitely recommend that you consider this. There is a lot of insight and inspiration in these songs and each of them is captivating in it's own way. Some of them, like "30 Pieces" may stick with you as a bit haunting, but it is something that is part of the Biblical record and it needs to be included here. Yes this is well worth listening to. I would very much suggest that you listen to the whole album in one go the first time that you listen to it. The songs are beautiful and they don't always make for easy listening. Then when you have heard the entire thing use one song at a time, one worship session at a time, to reflect on what the narrative of the song tells you about the nature of God and Jesus in this moment of earthly pain, shame, sacrifice and heavenly glory. Once you have been through this and seen the hope and love of God for you and the finality of the end of this album you can put on something different which celebrates the resurrection. Perhaps next year Sonlight might release a follow up focusing on the glory and victory of that moment, for now though check out this album and follow it up with Andrew Peterson's Resurrection Letters Vol I.